165 x 395 x 18cm. 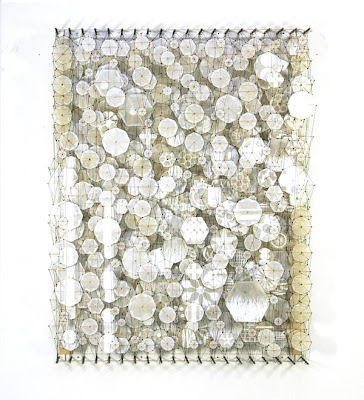 Jacob Hashimoto was represented by the Mary Boone Gallery at Art Basel Miami. There was a lovely installation that was very inspiring I thought I would share him with you.I love how decorative his work is using tying, knotting and little kites to create this magical world you can live in...even if its for a short time. 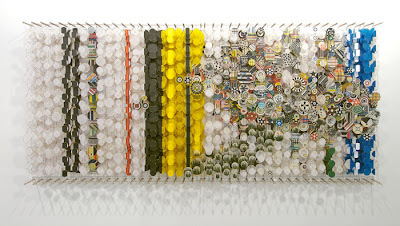 jacob hashimoto is one of the most interesting young activists in the contemporary art scene. what he does with paper creates real magic -a ravishing cascade of cloud white paper shapes flowing from ceiling to floor like a waterfall frozen by winters icy breath. viewing the piece fills you with a deep and profound stillness. jacob hashimoto is perhaps best-known for his installations in which he creates large-scale sculptural forms out of thousands of 'kites'. drawing on the tradition of kite making, he creates each of the kites by hand, using bamboo rods, string, and offset prints. or all of their exquisite lightness and ethereality, the sculptures are expression of air, light, and space.